A special thanks to Hilton for his post on the JRiver community forum: http://yabb.jriver.com/interact/index.php?topic=95760.0 and other JRiver community members! JRiver Media Center is the most comprehensive and seamless software available for managing and playing your media. Although, TuneBlade can stream all audio on PC to AirPlay receivers, but with this guide you’ll be able to create a dedicated audio zone for AirPlay streaming in JRiver MC making the experience even more seamless. The audio quality is degraded, sounding like it’s missing some low or high frequencies or sounds very low bit-rate. TuneBlade captures system-wide audio using WASAPI Loopback APIs. Music applications can notify Windows that they are playing protected content such as DRM files; On receiving such information, Windows degrades the sound quality on the WASAPI Loopback to copy-protect the audio stream. Hence, TuneBlade captures degraded audio from the OS which gets transmitted over AirPlay. We’ve found XBOX music application (Metro UI) on Windows 8 to degrade the quality on WASAPI loopback for all it’s audio. We haven’t seen other popular music application such as Spotify, iTunes, Amazon Music and several other web based players to cause the degradation. Although, it is possible that they may do so when playing certain files that require copy-protection. Another cause is when the Windows audio engine cuts off certain frequencies (usually low frequencies) that the laptop speakers cannot handle. Fortunately, the solution is quite easy. Install a kernel driver software which provides a virtual LineIn->LineOut digitally connected pair on the system, and then configure TuneBlade to capture audio through this pair. There are a few software which can provide virtual Line-In -> LineOut connected pair. We recommend VB-Cable Driver (Donationware). Or, if you already own a license to Virtual Audio Cable (VAC) or any other commercial application, you can use that too. For a step-by-step instructions, refer to the TuneBlade documentation on this topic here. Please feel free to post a query on the forum, or contact us at support@tuneblade.com for any further support on this issue. In order for the remote app to find and control TuneBlade on the local home network, a setting needs to be enabled in TuneBlade preferences as it is disabled by default. 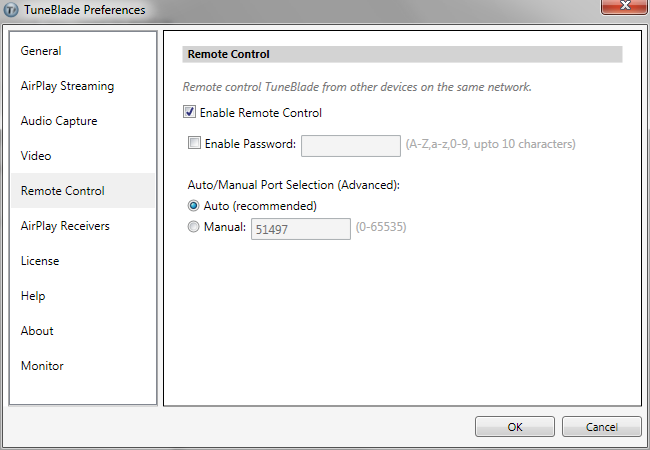 You can also optionally password protect remote access to TuneBlade. The app is free, but requires an in App purchase for being able to control the volume control. Without the In-App purchase, you’ll be able to control the connection status only. Note: The Remote control app runs on iOS 7.1 and above. 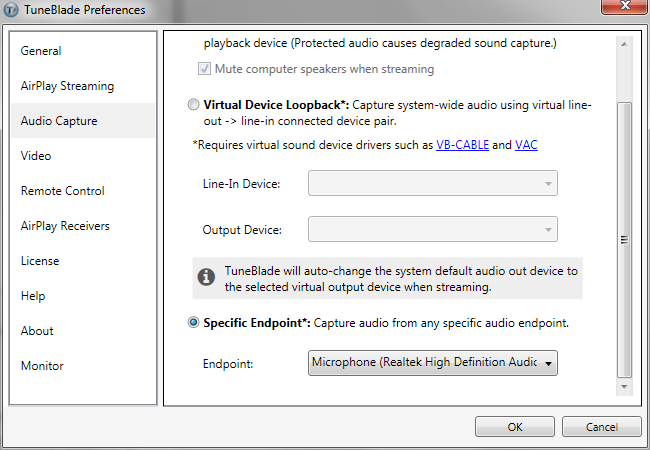 2) Capture audio from any audio endpoint: Earlier versions of TuneBlade captured audio from the default audio-out endpoint (sound device). With this version, any audio-out or audio-in endpoint can be selected. Audio from Line-In or Mic-In can now be streamed over AirPlay! 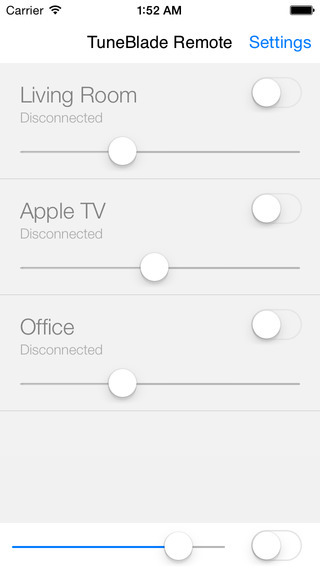 3) Selectively configure individual receivers to auto-connect when discovered: Earlier version of TuneBlade had the option to auto-connect to AirPlay receivers but the setting was for auto-connecting to all AirPlay devices. With this update, it is possible to select individually. 4) Configure time to standby an active connection: The connection standby feature in TuneBlade is there to disconnect from AirPlay receivers when no audio is being played on the computer for 20 seconds, and connect and start streaming automatically when audio is detected. The benefit is that it avoids unnecessary network traffic, and this also frees up the AirPlay receiver to receive streams from other devices. The downside has been that reconnection can take a couple of seconds and this means some of the audio is lost while the connection is made with the receiver. Many users have asked us if this auto-standby can be disabled as they don’t want to miss a single second of audio like the sound of notifications. We’ve now added a setting through which this can be disabled/enabled, and the time limit to standby can also be modified. 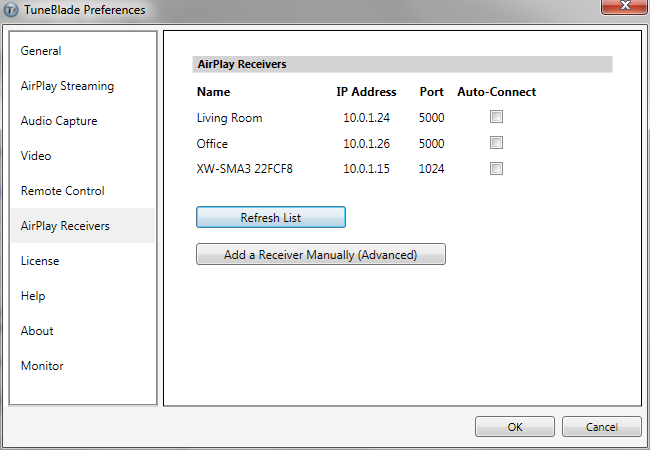 5) Add AirPlay receivers manually by specifying IP address and port number: TuneBlade auto-discovers AirPlay receivers on the local network using Bonjour (Zeroconf). Adding receivers manually can be useful in networks where Zeroconf networking doesn’t function properly or is disabled especially in colleges and corporate networks. Apart from the above mentioned features, we’ve done several bug fixes, tweaks and performance improvements. Do try this version and share your feedback at support@tuneblade.com or post on the Q&A forum. TuneBlade streams system-wide audio on Windows Vista, 7 or 8 to AirPlay receivers such as AirPort Express, Apple TV and several AirPlay speakers and HiFi receivers. 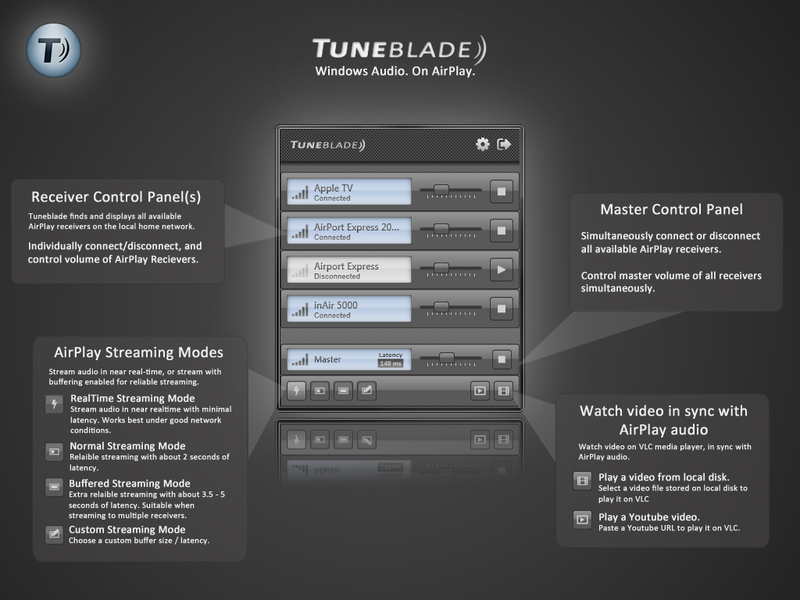 TuneBlade can stream to multiple receivers simultaneously in sync. 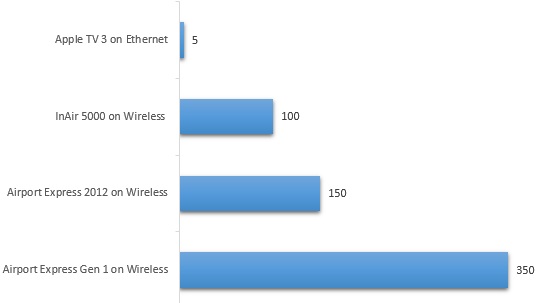 With TuneBlade, you can configure AirPlay audio latency that is optimized for your wireless network. About AirPlay audio latency: AirPlay audio receivers maintain a buffer, usually two seconds of audio to manage a smooth playback when audio data flow is patchy. The adverse effect of this is that the audio playback is delayed by the buffer duration. Many a times, the 2 seconds audio buffer is an overkill, and sometimes it isn’t enough and drop-outs can happen even with two seconds of buffering. With TuneBlade, this audio latency can be minimized to a fraction of a second. If you experiene drop-outs while streaming due to bad wireless connectivity, you could increase the buffer size to up-to five seconds that can result in smooth streaming. For real-time streaming to work smoothly, your wireless network conditions should be able to meet the latency requirements. This doesn’t necessarily mean that you need the latest or an expensive router for it to work. Our test set-up consists of a relatively old basic wireless ‘n’ router, and we’re able to stream in real-time. Real-time streaming may not work smoothly if streaming to say five AirPlay receivers simultaneously, or if other applications are consuming heavy network bandwidth, or if the PC or AirPlay receiver is far off from the router. We’re hopeful that for most users, real-time streaming will work fine especially when streaming to one or two AirPlay receivers simultaneously. When you stream to multiple receivers in real-time, TuneBlade will select the highest among the minimum acceptable latency of the connected receivers, so that all receivers can remain in sync. Select this option in the lower left region of TuneBlade interface to enable real-time streaming. Now, about scenarios where you may want to configure the buffer beyond 2 seconds. You may need to increase the buffer beyond 2 seconds in networks with high latency, mostly when your network consists of repeaters, or due to poor network conditions between your speaker, router and AirPlay receiver. If you encounter frequent drop-outs, you can switch to the buffered streaming mode (up-to 5 seconds of audio buffer and latency). Enable this option for maximum buffer, up-to 5 seconds. Enable this option for the usual 2 seconds buffer. 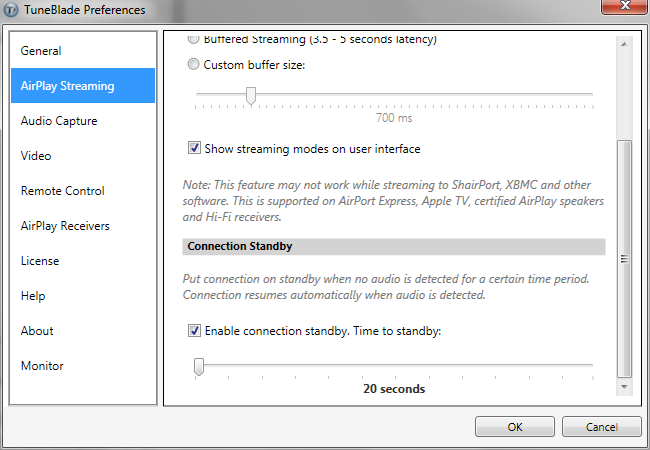 You could also stream with a custom buffer size by selecting this option. The value for custom buffer size can be configured from TuneBlade Settings >> Streaming. Switching between real-time, normal (2 seconds), buffered (up-to 5 seconds) and custom can be done while streaming without having to restart or reconnect. Shairport emulates an AirPort Express for the purpose of streaming music from iTunes and compatible iPods. It implements a server for the Apple RAOP protocol. Developed by James Liard. If you are streaming to Shairport or any of it’s ports/derivatives, TuneBlade’s latency configuration will not cause ShairPort to change it’s buffer size. AirPlay timing and synchronization is not currently available in ShairPort. It plays with a fixed buffer of 2 seconds. This can also cause Shairport (and it’s ports) to be out of sync with Airport Express, Apple TV and other speakers and receivers. With TuneBlade, you can watch a video on VLC media player and listen to the audio on AirPlay receivers in sync. 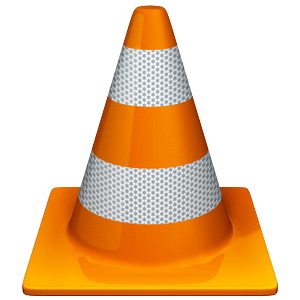 VLC media player is one of the most popular media player on the planet, it supports most multimedia formats, and it’s free. TuneBlade can control the audio latency of VLC media player to make the video synchronize with audio being played on AirPlay receivers. All you need to do is launch the media file from TuneBlade. You can play a video stored on your local disk or network share by pressing this button: in the lower right corner of TuneBlade interface. A new file selection dialog is shown, select a file and it should play on VLC. Even while streaming with a delay of 5 seconds, VLC video will be in sync with AirPlay audio. You can also play Youtube videos on VLC media player in sync with AirPlay audio. All you need to do is copy the Youtube video URL, and launch the video from TuneBlade by pressing this button: . A new window will appear where you can paste the URL, and then select the quality of video. TuneBlade will display video quality options similar to what you see on the Youtube’s video player. TuneBlade doesn’t check the available quality settings for a video, and it will allow you to choose any option. 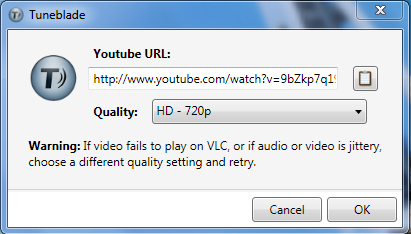 If you select a quality option not available for the video, the video will not play on VLC. You’ll have to retry launching the video from TuneBlade by selecting an available quality setting. TuneBlade is free to try. In trial version, streaming is interrupted after 10 minutes. But you can reconnect as many times you like.